These adapters consist of a printed circuit board with SMT pads connected to a pins spaced on 0.1 inch centers for mounting on standard prototype breadboards and DIP sockets. Pads and pins are wired one to one. 6SO-D3-SMT-S 6 pad SOIC package to DIP breadboard adapter converts SMT package with pitch of 50 mils to two 300-mil DIP pin rows. 8SO-D3-SMT-S 8 pad SOIC package to DIP breadboard adapter converts SMT package with pitch of 50 mils to two 300-mil DIP pin rows. DIP through hole pins on 0.10 inch centers. DIP rows are 300 mils apart. 14SO-D6-SMT-S 14 pad SOIC package to DIP breadboard adapter converts SMT package with pitch of 50 mils to two 300-mil DIP pin rows. DIP through hole pins on 0.10 inch centers. DIP rows are 600 mils apart. 16SO-D3-SMT-S 16 pad SOIC package to DIP breadboard adapter converts SMT package with pitch of 50 mils to two 300-mil DIP pin rows. 16SO-D6-SMT-S 16 pad SOIC package to DIP breadboard adapter converts SMT package with pitch of 50 mils to two 600-mil DIP pin rows. 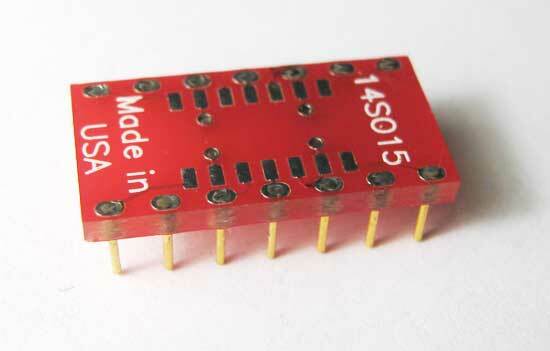 16SO15-D3-SMT-S 16 pad SOIC package to DIP breadboard adapter converts SMT package with pitch of 50 mils to two 300-mil DIP pin rows. 18SO-D3-SMT-S 18 pad SOIC package to DIP breadboard adapter converts SMT package with pitch of 50 mils to two 300-mil DIP pin rows. 18SO-D6-SMT-S 18 pad SOIC package to DIP breadboard adapter converts SMT package with pitch of 50 mils to two 600-mil DIP pin rows. 20SO-D3-SMT-S 20 pad SOIC package to DIP breadboard adapter converts SMT package with pitch of 50 mils to two 300-mil DIP pin rows. 20SO-D6-SMT-S 20 pad SOIC package to DIP breadboard adapter converts SMT package with pitch of 50 mils to two 300-mil DIP pin rows. 22SO-D6-SMT-S 22 pad SOIC package to DIP breadboard adapter converts SMT package with pitch of 50 mils to two 300-mil DIP pin rows. 24SO-D3-SMT-S 24 pad SOIC package to DIP breadboard adapter converts SMT package with pitch of 50 mils to two 300-mil DIP pin rows. 24SO-D6-SMT-S 24 pad SOIC package to DIP breadboard adapter converts SMT package with pitch of 50 mils to two 600-mil DIP pin rows. 24SO-D6-SMT-S-COH 24 pad SOIC package to DIP breadboard adapter plus pads for two decoupling capacitors converts SMT package with pitch of 50 mils to two 600-mil DIP pin rows. 24SO-D6-SMT-S-OH 24 pad SOIC package to DIP breadboard adapter converts SMT package with pitch of 50 mils to two 600-mil DIP pin rows. 28SO-D3-SMT-S 28 pad SOIC package to DIP breadboard adapter converts SMT package with pitch of 50 mils to two 300-mil DIP pin rows. 28SO-D6-SMT-S 28 pad SOIC package to DIP breadboard adapter converts SMT package with pitch of 50-mils to two 600-mil DIP pin rows. 28SO-D6-SMT-S-COH 28 pad SOIC package to DIP breadboard adapter plus pads for two decoupling capacitors converts SMT package with pitch of 50 mils to two 600-mil DIP pin rows. 28SO-D6-SMT-S-OH 28 pad SOIC package to DIP breadboard adapter converts SMT package with pitch of 50 mils to two 600-mil DIP pin rows. 32SO-D3-SMT-S 32 pad SOIC package to DIP breadboard adapter converts SMT package with pitch of 50 mils to two 300-mil DIP pin rows. 32SO-D6-SMT-S 32 pad SOIC package to DIP breadboard adapter converts SMT package with pitch of 50 mils to two 600-mil DIP pin rows. 32SO-D6-SMT-S-COH 32 pad SOIC package to DIP breadboard adapter plus pads for two decoupling capacitors converts SMT package with pitch of 50 mils to two 600-mil DIP pin rows. 32SO-D6-SMT-S-LC 32 pad SOIC package to DIP breadboard adapter plus pads and via holes for two decoupling capacitors converts SMT package with pitch of 50 mils to two 600-mil DIP pin rows. 32SO-D6-SMT-S-OH 32 pad SOIC package to DIP breadboard adapter converts SMT package with pitch of 50 mils to two 600-mil DIP pin rows. 36SO-D6-SMT-S 36 pad SOIC package to DIP breadboard adapter converts SMT package with pitch of 50 mils to two 600-mil DIP pin rows. 36SO-D6-SMT-S-OH 36 pad SOIC package to DIP breadboard adapter converts SMT package with pitch of 50 mils to two 600-mil DIP pin rows. 36SO-D6-SMT-S-COH 36 pad SOIC package to DIP breadboard adapter plus pads for two decoupling capacitors converts SMT package with pitch of 50 mils to two 600-mil DIP pin rows. 40SO-D6-SMT-S-OH 40 pad SOIC package to DIP breadboard adapter converts SMT package with pitch of 50 mils to two 600-mil DIP pin rows. 40SO-D6-SMT-S-COH 40 pad SOIC package to DIP breadboard adapter converts SMT package with pitch of 50 mils and pads for two decoupling capacitors to two 600-mil DIP pin rows. 44SO-D6-SMT-S 44 pad SOIC package to DIP breadboard adapter converts SMT package with pitch of 50 mils to two 600-mil DIP pin rows. 44SO-D6-SMT-S-OH 44 pad SOIC package to DIP breadboard adapter converts SMT package with pitch of 50 mils to two 600-mil DIP pin rows. 44SO-D6-SMT-S-COH 44 pad SOIC package to DIP breadboard adapter converts SMT package with pitch of 50 mils and pads for two decoupling capacitors to two 600-mil DIP pin rows.